Ten months since the launch of Jio, Reliance has launched the JioPhone, a low cost 4G feature phone for the masses. Feature phones are normally boring but what makes this one special is that it is basically free. 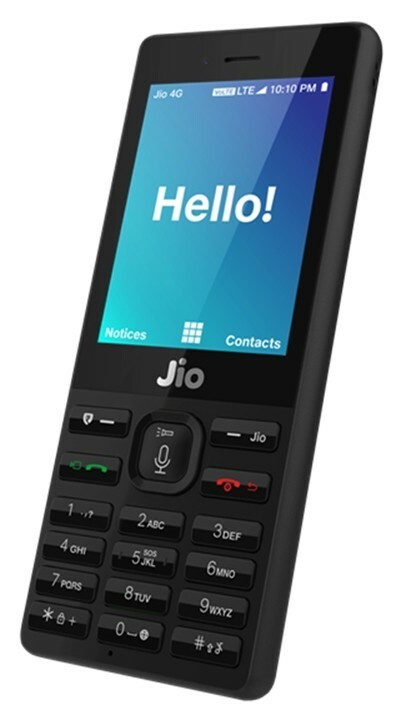 The JioPhone will be available to customers starting August 24. Customers will have to pay INR 1500 ($23) up front, which will be refunded after three years of using the phone when the phone is returned, essentially making it free. The cost of using the device is also rockbottom. As usual, local calls and SMS over Jio's 4G VoLTE network are completely free of cost. 4G data will cost INR 153 ($2.38) per month and will include 500MB 4GB data per day. Exceeding that will reduce the speed to 128Kbps until it resets next day. To make purchasing the data plans even cheaper, customers can choose to purchase a weekly plan for INR 53 or a 2-day plan for INR 23. Reliance has also provided a way to access the company's media streaming services. While the phone itself won't be able to handle these services directly, you can purchase an optional cable for the device and plug it into the television. Then you will be able to access Reliance's entire library of music, movies, and TV shows on the big screen. Access to the media library requires subscribing to the Jio Prime plans. The device itself is a basic feature phone with a 2.4-inch QVGA display and also has NFC functionality for digital payments. The phone will be available to beta testers from August 15 and open for pre-booking from August 24. Pre-bookers will get the device September onwards. The company also plans to manufacture the JioPhone locally starting Q4 2017.